Conophytums are my personal favorites ever since I was introduced to these miniature succulents. Though a bit tricky to grow, they are excellent plants for dish gardens. These miniature plants grow in small spreading clumps and usually form thick mat of succulent leaves. Each Conophytum plant consists of a pair of leaves that withers out to make room for a fresh pair in growing season. Some species also branch out – each branch consists of a pair of leaves. Conophytums come from winter rainfall regions of South Africa and Namibia where they grow vigorously in winter and go dormant in summer. 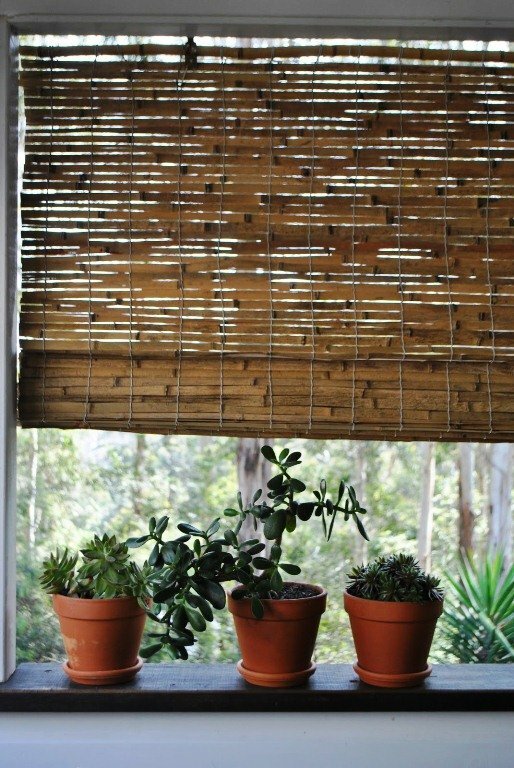 Thus the best way to grow Conophytum plants at home is to provide them with the same climate – generous watering under bright sunlight in winter, and barely moist in shady spots in winter. Grow Conophytums in a loose, PH-balanced and a well-drained soil. They are not hungry plants and occasional supply of water-soluble fertilizer in winter in usually sufficient. Ideal temperature for Conophytums is 10 to 25 ◦C. Most species of Conophytum bear yellow, white, purple or orange flowers in winter with a hint of fragrance. 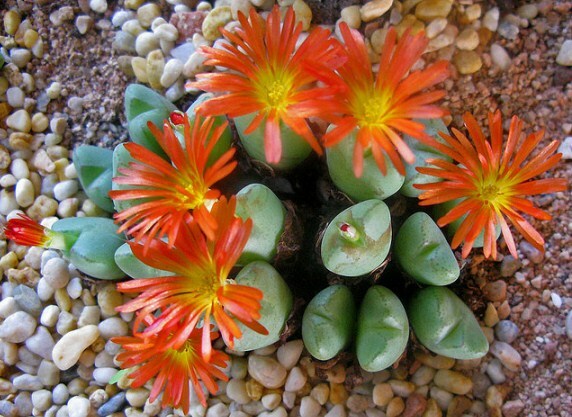 Usually grown from seeds, popular species of Conophytum include: C. obcordellum, C. truncatum, C. pellucidum, C. meyeri, and Conophytum gratum. 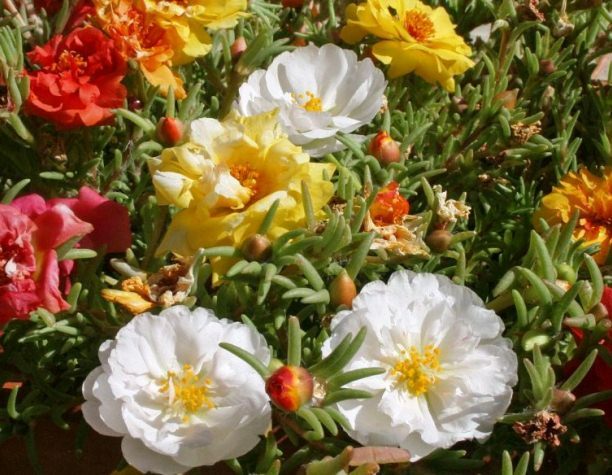 Portulaca (Buy seeds online), commonly known as Moss Rose, is a drought tolerant flowering ‘weed’ that bears splashes of colorful flowers in hot and dry climates. Both annual and perennial species of Portulaca are grown commercially and used as ground cover. Almost all species have small and fleshy leaves; grow without requiring much care, and love full sun. Portulaca is a perfect plant for beginners. They are propagated easily from seeds and adapt themselves in many different conditions – as container plants, as ground cover for hot and sunny locations, in hanging flowering baskets, ornamental plants for window gardens, or grown for edging rock gardens and pathways. Provide Moss Rose with moderate water in a well drained soil. Portulaca Grandiflora: The most popular and commercially grown species, Portulaca Grandiflora is a prolific bloomer that bears dazzling flowers of dozens of colors (yellow, pink, orange, red, white, cream) in single as well as double forms. Easily grown from seeds (usually self-seeding), Portulaca Grandiflora loves full sun, moderate watering and well-drained soil. Other popular hybrid species of Portulaca include: Double Sunset Fire, Tequila Series, Margarita Series, and Sundial Series.